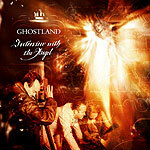 Ghostland are This Mortal Coil, or, at least, they seem to think they are. Lush neo-classical orchestrations, floaty atmospherics and a list of guests, including vocals from Jane Siberry, Sinead O'Connor and Ireland's own Cara Dillon, keyboards by Brian Eno and whistle by Liam Ó Maonlai. There's a nice mix of styles, from the full-on orchestrations of the title track, to the technofied acoustics of 'faith in love', where the ever present London Metropolitan Orchestra adds little more than decoration. It all sounds lovely and inoffensive, but it ain't Ivo! Ghostland are a sanitised version of the Coil, they have none of Ivo's experimental discordant moments; none of the sublime weirdness the 4AD roster could offer. Sinead O'Connor will never be a substitute for Liz Fraser. This has the potential to be much bigger than the Coil ever were, but that, in itself, says it all. Do yourself a favour; if you've never heard This Mortal Coil's "Blood", buy that before you even consider going near this.